The Third Daughter of the Queen wants to her birthday to arrive so she’ll be free to marry for love, but rumors of a new flying weapon may force her to accept a barbarian prince’s proposal for a peace-brokering marriage. Desperate to marry the charming courtesan she loves, Aniri agrees to the prince’s proposal as a subterfuge in order to spy on him, find the weapon, and hopefully avoid both war and an arranged marriage to a man she does not love. 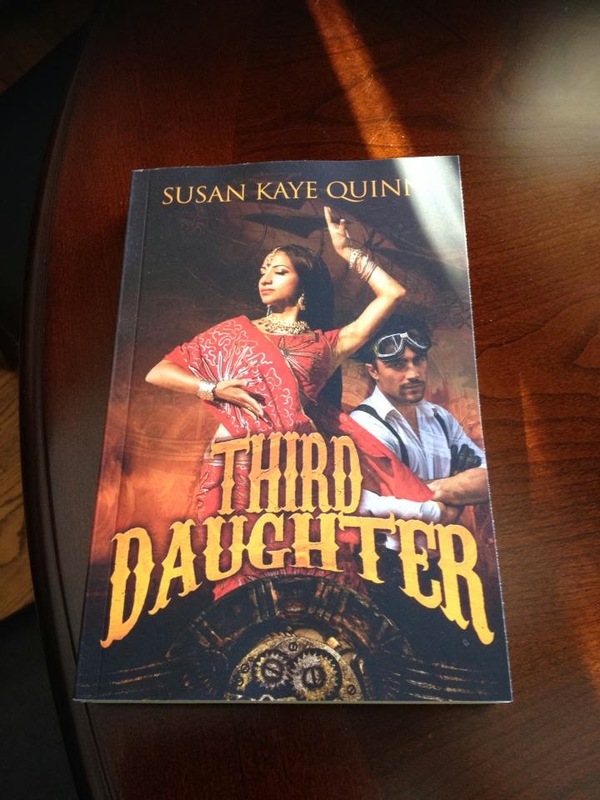 Third Daughter is the first book in the Dharian Affairs Trilogy (Third Daughter, Second Daughter, First Daughter). 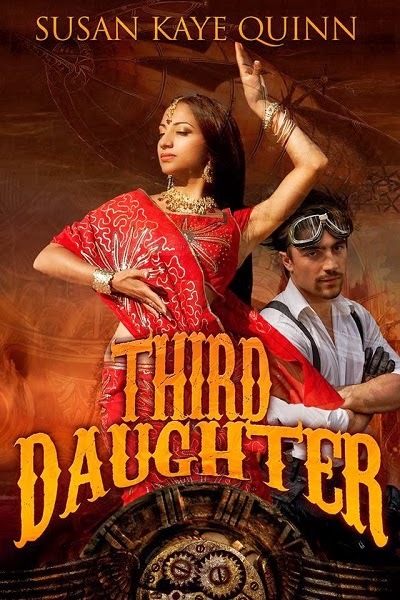 This steampunk-goes-to-Bollywood (Bollypunk!) romance takes place in an east-indian-flavored alternate world filled with skyships, saber duels, and lots of royal intrigue. And, of course, kissing. While The Dharian Affairs trilogy has ended, the steampunk romance is just beginning. The new peace in Samir is uneasy at best, and the new technology Mistress Tinker Riva and her Free Tinker friends have invented could change everything… A brand new bollypunk trilogy (The Tinker Tales) is tentatively coming in 2016. A huge shout-out of thanks to Steven Novak for the amazing cover and to Ali Cross for making the inside of both the ebook and the print version GORGEOUS. 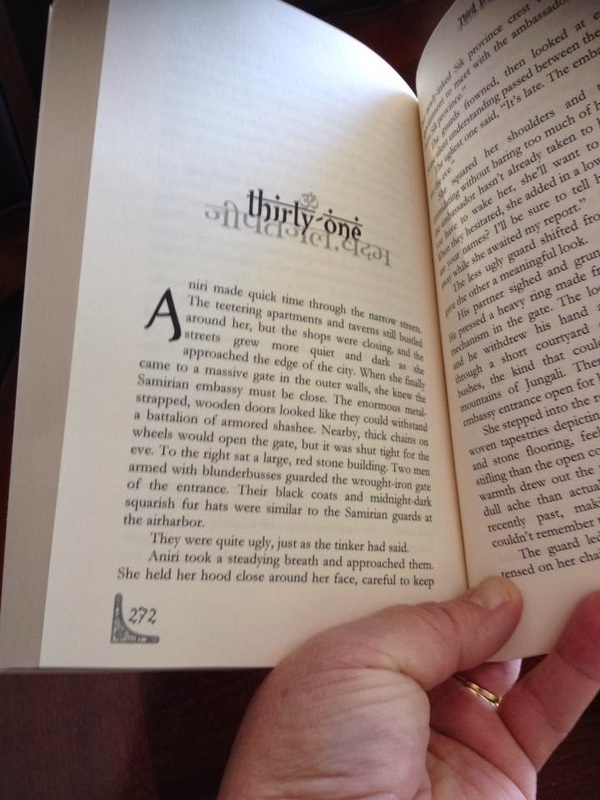 With details like steampunky footers and east-Indian chapter headers… I love all my books, but I just drool over this one. The print edition is available (and gorgeous). The cloudless night whispered sweet promises to Aniri. Below her stone rooftop, the shadows of the forested grounds danced in the summer’s breeze, their small rustlings calling to her like a lover. The sound was the perfect cover for escape into the darkness and the warm arms she hoped to find there. No one should notice her absence. Of all the guards, handmaidens, and many silent keepers of the royal household, none would venture up to her private observatory this late in the eve. But she still had to be careful. Even this close to her birthday, the Queen would not be forgiving if she was caught. Aniri scanned the palace grounds to make sure it was clear of any witnesses. The manicured lawns were empty: the only sign of life came from the distant embassy windows where gas lamps flickered and soft music trilled from late-reveling partygoers. Aniri pressed the leather eyecup of her aetherscope to her face, slowly turning the brass knobs to bring the party into focus. The instrument was meant for watching the rise of the twin full moons, but it worked well enough for spying on the Samirian ambassador and her assemblage of guests. Their shiny new automaton was thick-legged and awkward, but the Samirian tinker’s design was still clever: the steam-driven mechanical wonder actually danced, albeit just one clumsy pirouette after another. When it came to a graceless stop, the guests snapped their fingers in appreciation. The faint sound of their applause drifted over the lawn, but the party continued on. With the grounds still empty, Aniri swung her aetherscope to the forest. The broken edges of the river snaked through the darkened trees, slipped under a stone bridge, and then flowed past the red sandstone walls of the Queen’s estate. A black shape darted out from under the bridge, then disappeared into the shadows between the trees. She peered over the edge of the balcony. No sense in being caught by someone who snuck out for a dalliance in the dark. With the way clear, she opened the leather satchel at her feet and uncoiled the sheet she had twisted into a rope. Always check your knots, Aniri. Her father’s voice accompanied her on every climb, but she had to wonder what he would have made of this particular one. She rechecked the knots. It would cause quite a stir if she plummeted to her death while climbing down the palace wall. The massive stone lion that guarded the parapet served as an excellent anchor. She looped the rope around it, then stood on the edge of the wall and leaned out over the blackness. Loop the rope under and between your feet, Aniri. It will carry your weight. Practical advice, but the knots would impede her progress, and speed was of the essence. She lowered herself, hand over hand, bracing her feet against the wall. A mossy spot, hidden by the dark and slick with dew, sent her silk slippers pawing rapid-fire several times before she found purchase between the giant stone blocks. Always use the proper equipment. She took a deep breath. Her father would probably disapprove of her attire. Silk nightclothes were hardly climbing wear, and she couldn’t find any plausible excuse to wear her climbing shoes to bed. Her handmaiden, Priya, was far too clever for that—and already suspicious when Aniri wanted to retire to her observatory alone. At least she had her fingerless climbing gloves, and on every climb she wore the thin, braided bracelet her father gave her. For luck. She thought he would approve. Hand over hand, Aniri continued her descent. Halfway down, a sudden clacking broke the quiet and rose above the scrapings of her slippers on the treacherous walls. She held still against the cool stone, hands gripped tight on her rope of sheets. A lone two-wheeled surrey ambled out of the shadows of the Samirian embassy and headed toward her dark corner of the Queen’s estate. Aniri held her breath and silently cursed the full two-moon night. If the carriage came much closer, the occupants would surely see her clinging to the side of the palace like a spider on her thread. The six-hooved beast pulling the surrey slowed as it neared the giant stone statue of Devkasera. The mother goddess of ancient Dharia loomed larger-than-life, threatening the carriage with a sword and a scroll—the powers of destruction and creation—clasped in two of her six hands. The Queen loved the ancient traditions, so the goddess held a place of respect in the middle of the palace lawns. Aniri preferred the clean streets and steam-driven inventions of modern Dharia to the unwashed feet and mystic religion of her country’s past, but that didn’t stop her from sending a silent prayer to Devkasera—for invisibility for herself or perhaps a sudden loss of sight by the persons in the carriage. The surrey paused at the statue, then veered right and headed for the far wall that enclosed the estate. Aniri repressed a laugh—perhaps she should pray to Devkasera to bring her birthday sooner as well. Her arms ached from holding her position, but she waited until the carriage had passed through the palace gate. Beyond it, the lights of Kartavya, Dharia’s capital city, winked through the coal-smoke haze as if giving her an all-clear signal. Her muscles rejoiced when she moved again, working her way down the last half of the wall and dropping the final two feet. From there, she scampered over the surrounding manicured hedgerows as if she had fled the palace a hundred times before. Her unbound dark hair flapped behind her, and the cool night breeze fluttered her black silk nightclothes against her skin like a thousand butterfly wings. It was the feeling of freedom breathing against her, and she had to clamp her teeth against the giggle that threatened to ruin her escape. She slowed and picked her way through the darkened brambles of the forest grabbing at her legs. The first time, she slipped away from dinner in her normal evening attire—a midnight-black corset latched with brass clasps, a starched skirt of blood-red silk, and a sweep of silk over her shoulder for the traditional touch the Queen required. Aniri thought the dark colors would ease her escape, but she had stuck to the needled branches like a royal pincushion. The second time, she cast aside the bodice and most of the silk, keeping only her short bloomers and camisole—essentially running through the forest in her unmentionables. That had been deliciously decadent, but also very chilly. This time, her nightclothes were proving the most suitable costume yet for midnight escapades. She smiled and slipped through the forest like a phantom, black on black, silent and stealthy. The faint trace of coal smoke gave way to the fresh scent of leaves mixed with river mist. She breathed it deep: the lushness of it always captivated her. The Queen had imported trees and beasts from the barbarians in the north to recreate the Dharian forests long ago swept away by agriculture. Fortunately, her majesty favored the gentle animals sacred to the gods. Aniri was careful not to disturb a long-tailed bandir hanging from a branch, eyes closed and peaceful. She didn’t believe the superstitions about waking one, but she couldn’t afford the screech it would let loose. Aniri broke out of the forest and onto the wet rocks bordering the river. The footbridge ahead was a silent sentinel over the constant chatter of the river. There was no sign of movement. Was she too late? But then Devesh stepped from the shadows, showing his face to the moons as if he had nothing to hide. She skittered over the slippery rocks and flew into his arms. “Aniri,” he said, but she was uninterested in wasting precious moments with words. She shut him up with her lips pressed fiercely to his. He closed his dark, humor-filled eyes, and wrapped his arms around her. Being a courtesan, he was well-trained in courtly conversation, but the artistry of his lips moving slow yet urgent against hers made her forget her own name. The silk of his jacket was smooth under her hands, the steel studs of his collar cool on her wandering fingertips. When she broke their kiss, the moonlight bleached the color from his Samirian diplomat attire: the deep russet brown of his jacket turned black, and the parade of buttons across his chest shone like stars against it. She grinned and flushed with the memory of their fevered kisses. Their grapplings were still innocent, but that night, they had ventured closer to the passion they would share one day. Her skin prickled, her clothes even now a thin barrier between his hands and her bare skin. “Some activities require a certain type of attire,” she said. She no doubt did. Priya was constantly gaming the odds of one match or another at court. His words were as intoxicating as his kisses. She reached up, eager for more. Devesh slowed and deepened their kiss, taming her feverish passion with a deliberation that made her even more crazed. Waiting to be with him was like a slow torture of endless minutes. But the day was coming: she could almost taste its nearness like the mouth-watering scent of a long-hungered meal just outside of reach. Soon she would be free: free of the court, free to kiss in broad daylight, free to leave Dharia behind and find the vermin who killed her father. Devesh had promised to help her search his country until they found the men responsible. She ached for that day like she did for Devesh. Soon she would have both. Her laugh was cut short by the realization that a man stood in the shadows behind Devesh, watching them with a look that would cut stone. She jerked in surprise, let out a small shriek, and only recognized the owner of the stare when Devesh turned to see. “It is my job, my lady.” His gruff voice and scarred, angular face held no apology. Janak was raksaka, the deadly protectors of the royal household for generations, known for their ability to move unseen and unheard and for their unwavering loyalty to the Queen. Less so for their tact. She glared at him. His lack of respect was less concerning than the fact that he stood before her at all. His standard all-black raksaka attire was like one long piece of light-stealing fabric continuously wrapped around his body, and he nearly blended with the forest, even now as she was looking straight at him. His soft-footed boots had served him well in tracking her unnoticed. She turned to find Devesh had retreated, restoring a proper distance between them. “Arama, Princess Aniri.” He gave her a small bow, hands pressed together with the casual greeting as if they had not just been caught in each other’s arms. She sighed. The evening was ruined, but the greater danger was that Janak would report them back to her mother. He wasn’t simply raksaka, but the Queen’s informal advisor as well. “Wait for me,” she said to Janak with as much royal disdain as she could muster. “Over there.” She gestured with a single raised eyebrow of her own that he should stand apart by the bridge. Raksaka only retired when incapable of serving, but if he betrayed her secret, by the Queen’s breath, she would seek an early retirement for him. If there were any justice in the world, he would have been retired long ago. Janak smiled, a look that was simply bizarre on his face. In fact, Aniri couldn’t remember ever having seen him smile. Until that moment, she would have said he wasn’t capable of producing one. “Prince Malik has made an offer of peace,” Janak said. “I don’t need lectures from a palace guard.” But the truth was she paid little heed to the politics of her mother’s court. She was Third Daughter—there had never been a need. “Indeed.” Janak’s smile grew wider, and the panic in her chest bloomed even as she struggled to keep from giving him the satisfaction of seeing it. She was so close to being free, so close… Her eldest sister, First Daughter Nahali, had arranged her own marriage by choosing a respectable Dharian noble: she would carry on the Queendom. Second Daughter Seledri’s arranged marriage to a prince of Samir had forged another bond in the long-lasting peace between Samir and Dharia. That left her, the Third Daughter, free of royal obligation once she came of age. Free to marry for love. Free of the tightly scripted palace life that choked her like a silken gag. Devesh’s hand landed on her shoulder, making her jump. “Aniri, listen to me. You must refuse him.” He turned her toward him, his grip growing stronger, and she winced at its strength. A scuffle of pebbles told her Janak loomed at her back. He might wish to see her forced into a duty she never wanted, but he would protect her with his life. Even Aniri didn’t doubt the loyalty of raksaka to those in direct line for the crown. No matter that she was as likely to become Queen as he was. They had met in the Queen’s training hall, where Aniri had accepted the handsome new fencing instructor’s offer of lessons even though she had fenced for years. The hall would afford them some privacy, whereas at the Queen’s tea, she could hardly look at Devesh without arousing suspicions. “I will meet you there,” Aniri said softly. But an ache already stabbed her chest: a fear that somehow it might be her last time with him. He stepped back. “Very well. Gods be with you, my lady.” He bowed deeply in farewell and turned to slip away into the darkness. The shadows swallowed him along with possibly her last chance of a carefree life. She stared after him, her stomach wrenching into knots tighter than the rope she’d fashioned to steal away to him. When Aniri had composed her face, she turned and marched to Janak, the slick rocks by the riverside cutting into her slippered feet. She stared up at the impassive face of her guard. Why her mother insisted Janak, of all the raksaka, attend her was beyond her understanding. It mattered little to Aniri that he had attained the highest rank among the raksaka, that he had served the Queen in many duties both at home and abroad, or that he was the Queen’s most trusted advisor. He had failed in the one duty that mattered to Aniri: protecting her father from the common robbers who’d killed him. And now Janak stood there, holding in his hands dangerous knowledge about the only man she had ever loved half as much. She glared at him, not sure if her threat carried any weight at all. Finally, she brushed past him, marching toward the palace without a look back. He shadowed her all the way as though he expected her to bolt for freedom and disappear into the dark after Devesh. She only wished that were possible. Subscribe to Be Notified When The Next Dharian Affairs Book Releases!